scan0003, originally uploaded by Mic2006. 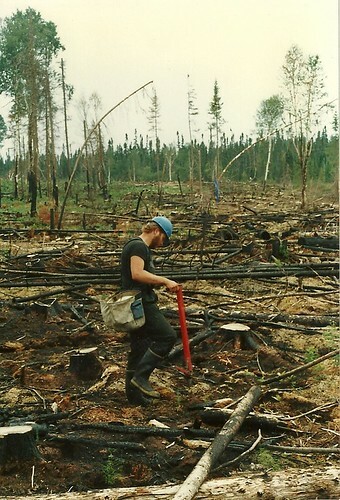 This is what a burn site looks like – typical of the kind of terrain a tree planter works in. The planter is a guy called Don who was a film student in Ryerson, he carries ‘container stock’ and is using a pottie (potty) to put his trees in the ground. The idea is that you take your seedling out of your planting bag – roots neatly encased in a little cardboard roll – and drop it down the red tube that Don is holding. At the bottom of the tube is a spike that is driven into the ground. The measure of a well planted tree is whether the duff (organic matter) has been kicked out of the way first. Stomping on a lever at the bottom of the pottie, the spike opens up and the seedling is dropped into the hole that the spike has made. Don looks pretty clean so either he was bathing in the swamp near the camp or I took the picture within about five minutes of beginning work. I remember by the end of that two week contract we were totally black and nobody bathed, firstly it attracted bugs and secondly the leaches in the swamp were these huge ribbony things that would flitter through the water toward whoever was in it. One of my jobs was flagging the land and I would be out there marking off the planting areas for the next day long after the planters had all gone back to camp. I remember one evening I was way off in some burn site and the sun had already set, it was real spooky and I was convinced that there was some creature following me – maybe it was a bear or coyote or something, but at the time I was thinking it was a Sasquatch. I believe this burn site was somewhere near Bancroft. scan0001, originally uploaded by Mic2006. Well, Rockwatching has been up and running for a number of years now (5 to be exact) and I believe it has contributed significantly to the interest of people like myself who like caving, rocks, the outdoors, gems and minerals in Ontario. We are just a few short days from 2011 and I believe it’s high time we made some resolutions -all of us (you my loyal fellow bloggers as well). 1) Lets not carry a personal vendetta onto this site which is meant to be a forum where like minded enthusiasts can interact in a positive way. 2) Lets respect each other and try not to get personal when we are frustrated. 3) Lets respect the basics of conservation and eco-minded thought. 4) Lets not assume stuff we don’t know for sure (hence the survey at the bottom of the post). 5) Lets keep in mind that this is all about enjoyment. 6) Lets keep in mind that just because the topic is on the table, every single aspect that pertains to it is not an open book. 7) Lets respect people who are not on the site, private property, reputations etc. Just because there is discussion of a site or feature does not mean permission has been granted to go there. 8) Lets not get petty, self righteous or important. Stop correcting my grammar, spelling or use of terms. I am a writer at heart and so I believe I can use the language as I please (providing it’s in good taste, or if I choose, not in good taste). 9) Lets not waste my time by having to re-direct you to one of the above rules. Locals call him “old yellow mane”. IMG_1821, originally uploaded by Mic2006. Though Doug Shier tells me that all roads in the area lead back to Cobalt, I am warned by an older gent in the Silver Load Hotel’s restaurant to be careful out there if I am exploring the ore piles. It was a little cryptic; you might say kind of creepy. I thanked him for the advice, finished pouring my coffee and headed out. I wondered what he might be alluding to. Maybe he was talking about getting lost or falling down a shaft like the Chinese laundering family-hmmmm (They all disappeared one night leaving the food still cooking on the stove – never to be seen again – see one of my earlier posts on Cobalt). Once out there it really began to play on my mind. I had followed an old tramline down a narrow valley between towering white pines. I was in a hidden valley that for some reason had escaped the miners axe. There was supposedly an abandoned mill a few kilometres up the path. My source told me that it was on the left hand side just before the tailings swamp. From the impressive “Little silver Vein Mine” I had followed a short incline up to the tramline. I soon found myself pushing along a tree-lined tunnel of soft, feathery-limbed tamarack and cedar. It was a wonderfully “organic experience” that started off in a relatively wholesome way but eventually began to feel quite creepy. The further I went the more subdued the forest became. Eventually there was only deathly silence. I found myself dwelling on the oddly disturbing feeling of being watched. I thought back to something that I had recently read of. It was the appearance of “Old Yellow Mane”. He is Ontario’s northern Sasquatch. 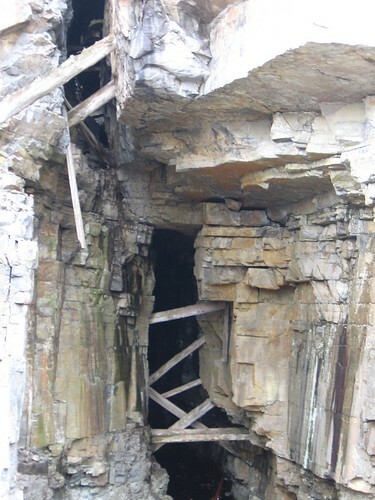 Yellow Mane had first been seen in 1906 by miners at the nearby Violet Mine. He was seen again in 1923 by two prospectors who surprised him while he was picking blueberries. They supposedly threw rocks at the poor fellow and he ran away. As was reported in the North Bay Nugget, Yellow Mane was seen for a third time in 1946. A woman and her son saw him ambling along beside some rail tracks. I never found the mill or “Old Yellow Mane” but the walk was quite surreal.